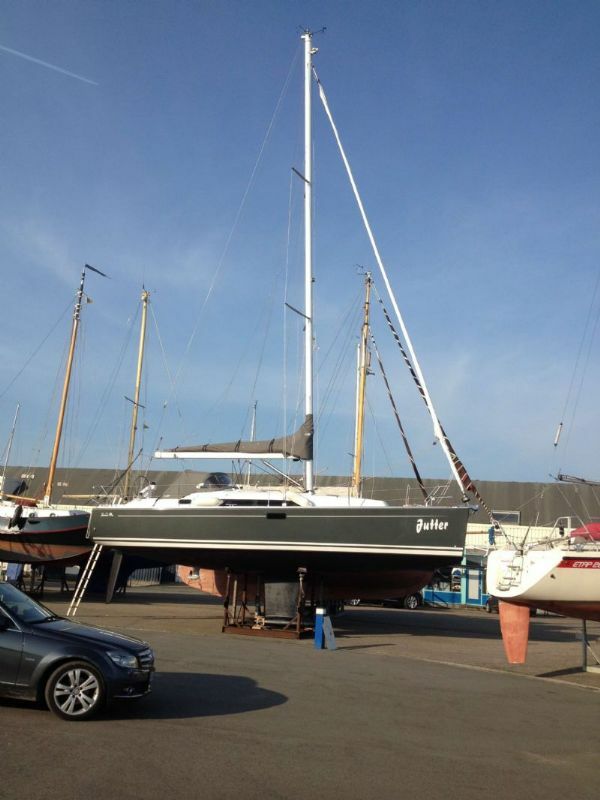 what boatrack should i use for my Hanse 350? very heavy at the back. The local yard always used their normal 4 leg stand for my H350 without any problem. In fact the boat rests on the keel and the stands do mainly stabilize the boat, they don't take the full weight of the boat. I'd use (& use with my 371) a normal rack with 4 legs + additional support behind the drive. It's winter in Denmark. Go and have a look at all the Hanses standing in their racks close by the harbour. There must be a couple of Hanse boats in your own harbour. If you are nervous about the Hanse weight being unevenly positioned, just place a extra support behind the s-drive. 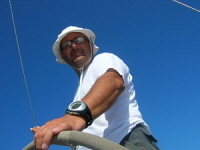 Placing a strap (truck type/lastbilstrop) from the rack over the deck, will also help the boat to stay firmly in the rack. I also do not see why the yard is so fussy about Hanses, as I cannot see why they should differ from a yacht fitted with a saildrive. Make sure they yard know where the saildrive is when lifting the yacht out. 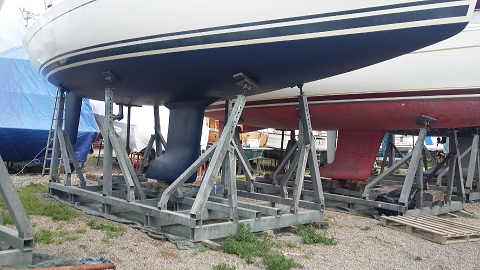 The first photo shows my 341 on one of the yard 4 leg cradles in the year when I first bought it and the mast is down so I could have some work done on it. The second photo shows the cradle I have used for a few years. Largs Marina in Scotland is quite exposed and they do not allow yachts to be supported with just props if the mast is up, it has to be on a cradle. The Yard people thought my transportable cradle was a bit light, so they have put in a couple of extra props. The mast was down the year this photo was taken for a rigging check, but normally it would stay up. 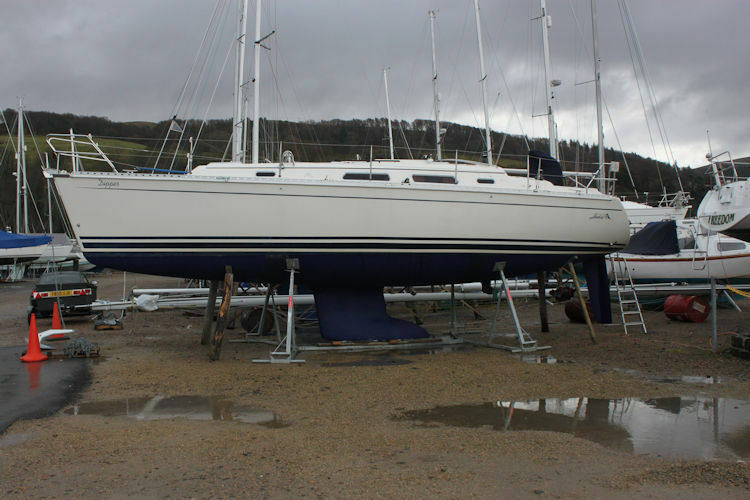 As mentioned previously, the bulk of the weight of the yacht should be on the keel. One point to remember is to make sure the adjustment screws on the legs are locked off, as they can work loose during a windy weather. I have actually added another pair of legs to the cradle this year, just to make it more secure, especially since more of the boat yard has now been tarmacced and hence they cannot use props in that area.. Since an image tells more than a thousand words i join this image to complete my earlier post. Jutter I think your cradle is way to small. 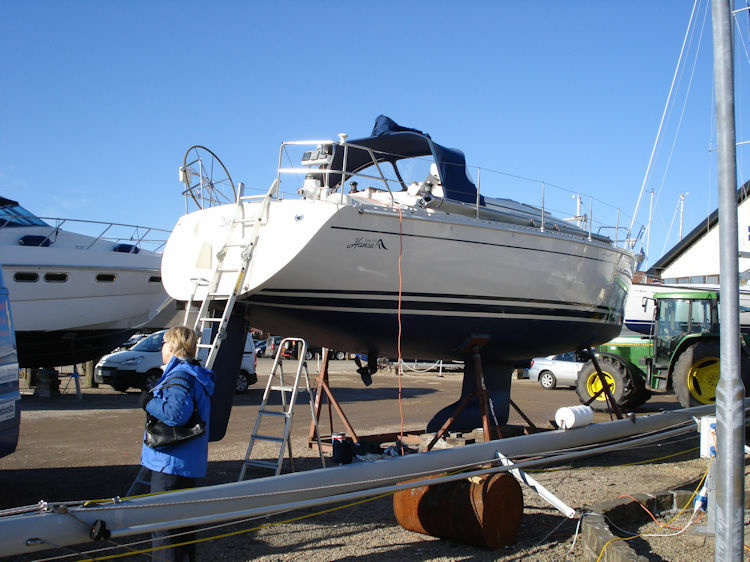 If something happens during the winter and your boat gets damage your insurense probebly will not pay. The cradle on the image is only used while my boat is on the hard for antifouling and servicing anodes etc. She is lifted out of the water in the morning and put afloat again the same evening, or the day after at last. But you are probably right about the size of the cradle if I intended leaving the boat on the cradle for a longer period or for the winter. But that would still be a (bigger sized) cradle with no more than 4 legs. In case of any doubt, adding an extra stabilizing support aft of the saildrive is easily done.